This GE Profile 1.8 Cu.Ft. Over-The-Range Microwave Oven fits in the space of your range hood. It is equipped with a ventilation system and lighting system for the range below. It features Electronic Touch Controls with 10 Power Levels which offers the flexibility to accurately cook any meal, from frozen entrees to refrigerated casserole dishes. It also features Child Lock Out which allows you to lock the control panel to prevent the microwave from being accidently started or used by children. 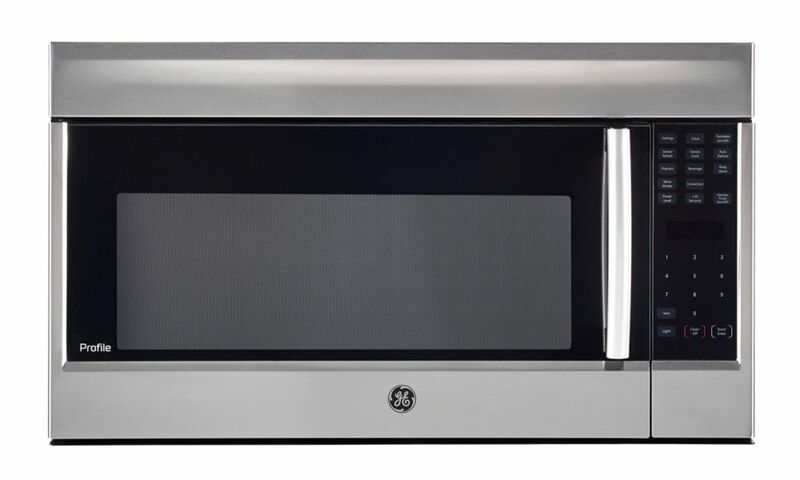 This GE 30 inch Free Standing Electric Standard Clean Range in Stainless Steel, features a large 5.0 cu. ft. oven capacity that provides an impressively large interior for cooking more dishes and large meals at one time. This model features a glass-ceramic cooktop, made with a specially engineered ceramic glass that has an amazing resistance to both stains and impact. The range features Dual Element Bake, which alternates the upper broiling element and the lower baking element for even heating and optimal baking results. GE Profile 1.8 CF OTR Microwave This GE Profile 1.8 Cu.Ft. Over-The-Range Microwave Oven fits in the space of your range hood. It is equipped with a ventilation system and lighting system for the range below. It features Electronic Touch Controls with 10 Power Levels which offers the flexibility to accurately cook any meal, from frozen entrees to refrigerated casserole dishes. It also features Child Lock Out which allows you to lock the control panel to prevent the microwave from being accidently started or used by children.